The Giro della Toscana and Coppa Sabatini take place in the provincial region of Tuscany, our African Team's home away from home. With our training base in Lucca, the Giro della Toscana is very much our local stage race with both stages taking place on familiar training grounds. The first stage of Giro della Toscana could see a reduced bunch kick while a mass sprint is expected on the final stage. The Coppa Sabatini is comprised of numerous circuits, each containing a fair amount of climbing and the punchers are expected to shine on this day. 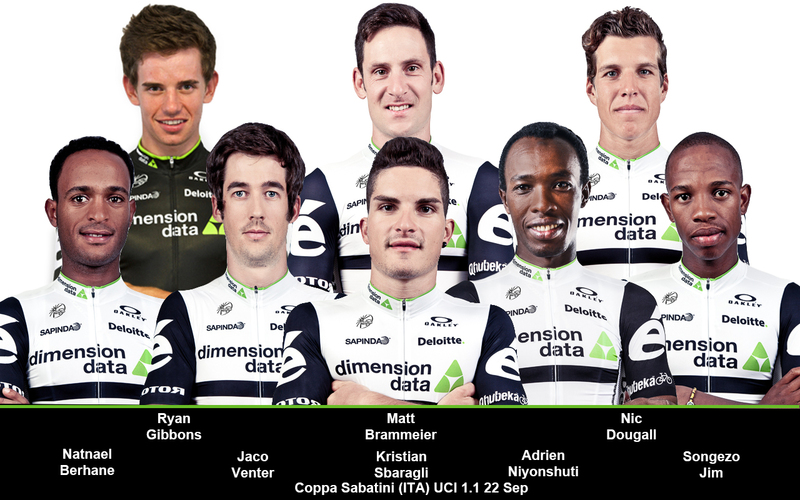 Team Dimension Data for Qhubeka will rotate our squad between Toscana and Sabatini but our goal will remain the same at both events, to place a rider on the top step of the podium. Mark Cavendish will lead our charge at the Giro della Toscana and he will be supported by an incredibly strong team. Steve Cummings, Kristian Sbaragli, Serge Pauwels, Igor Anton, Natnael Berhane, Daniel Teklehaimanot and Merhawi Kudus will be present at Toscana. The Coppa Sabatini is a race which suits Kristian Sbaragli's capabilities and he will be counting on Natnael Berhane, Matt Brammeier, Nic Dougall, Songezo Jim, Adrien Niyonshuti, Jaco Venter as well as our feeder team stagiare Ryan Gibbons. Gibbons showed some good form in Italy last week already, finishing in a good 7th place at the UCI 1.1 Coppa Bernocchi while racing for the Team Dimension Data for Qhubeka continental team. I am looking forward to both the races this week. For our team, it is racing very close to where we live and train in Italy. We will have a good team throughout the week and we have the ability to contend for the win each day with some different riders. Obviously with Mark Cavendish, we have a great chance for sprint wins and also with Kristian Sbaragli if it is a smaller group, and Steve Cummings is always strong so we have a good team. The Italian races are always very hard though so we will definitely race positive and be part of the action.